Even on the ground the plant cover is quite transparent and the shielded life of partridges is much better visible. It can be worthwhile to watch sparsely weedy areas on cultured grounds and meadows and the seashore, and on harvested cereal fields there are plenty of spilled seeds. 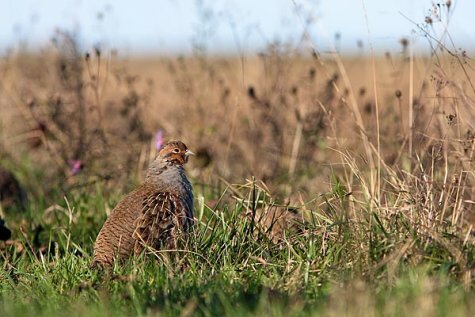 The plumage of partridges is brown, the breast grey, tail rust-coloured – a quite good camouflage. The male has a brown patch on the belly; it is less noticeable on females and young birds, otherwise the plumages are similar, the young birds are just somewhat duller. Beak dark, legs grey and live weight about four hundred grams – the size of a young hen. The numbers of partridges are kept down by foxes, raccoon dogs, small predators, birds of prey and severe winters. During recent decades their numbers have decreased; up to five thousand pairs are estimated to be nesting.